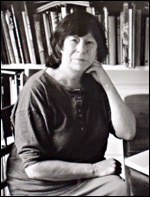 Between 1974 and 1982 Mulvey co-wrote and co-directed with her husband, Peter Wollen , six projects: theoretical films, dealing in the discourse of feminist theory, semiotics, psychoanalysis and leftist politics. The first of these, Penthesilea: Queen of the Amazons (1974) explored concerns central to Mulvey 's writings: the position of women in relation to patriarchal myth, symbolic language and male fantasy. Penthesilea represents an experimental British venture into territory pioneered by the likes of Jean-Luc Godard . With its counter-cinema style and relentlessly didactic approach, however, its appeal was inevitably limited to a restricted audience. The most influential of Mulvey and Wollen 's collaborative films, Riddles of the Sphinx (1977), presented avant-garde film as a space in which female experience could be expressed. Remarkable formalistic innovation, notably 360-degree pans, inform the film's content, describing the mother's loss of and search for identity. The result is a challenging, forceful and intelligent film. AMY! (1980), a tribute to Amy Johnson , is a more accessible reworking of themes previously covered by Mulvey and Wollen , but it is ponderous and slow. Far from a conventional biopic, the aviator is used as a symbolic figure, her journey exemplifying the transitions between female and male worlds required by women struggling towards achievement in the public sphere. Crystal Gazing (1982) represented a departure from the emphatic formalism of Mulvey and Wollen 's earlier films. It demonstrated more spontaneity than previous works, both in performances and in the storyline, elements of which were left undecided until the moment of filming. Bleak, but with playful touches, this representation of London during the Thatcher recession was generally well received, despite criticism of Mulvey for the lack of a feminist underpinning to the film. She admitted she had been reluctant to incorporate feminist polemics fearing they would unbalance the film. Frida Kahlo and Tina Modotti (1982) and The Bad Sister (1982) followed, revisiting feminist film issues. After these, Mulvey did not return to film-making until 1991 when production began on her solo project Disgraced Monuments , an examination of the fate of revolutionary monuments in the Soviet Union after the fall of communism. Laura Mulvey is Professor of Film and Media Studies at Birkbeck College , University of London .